Feed your indoor kitty’s wild side with the holistic nutrition of Blue Buffalo Freedom Indoor Adult Chicken Recipe Grain-Free Dry Cat Food. 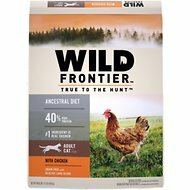 Made with real chicken as the first ingredient and never any grains, glutens, wheat or by-products, it packs a powerful protein punch to support your little hunter’s overall health and satisfy his cravings for meat with every bowl. It’s loaded with antioxidant-rich LifeSource Bits―a unique blend of vitamins, minerals and superfoods to support immunity―plus omegas, taurine and essential amino acids to fuel all those indoor adventures. Plus, it helps maintain healthy digestion for happy tummies with probiotics in every bite. 100% grain-free indoor recipe features protein-rich chicken and turkey to help build strong muscles. 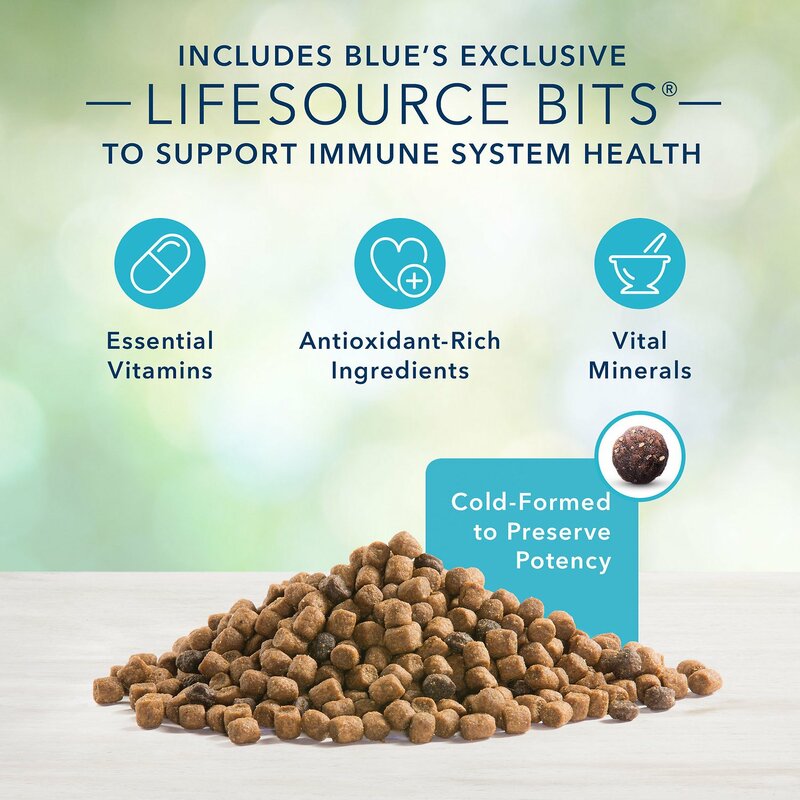 Packed with omegas, amino acids and LifeSource Bits―an exclusive blend of antioxidants, vitamins, and minerals―to support a healthy immune system and overall well-being. Supports healthy digestion and nutrient absorption with prebiotic fibers and probiotics, and helps maintain an ideal weight with balanced calories from proteins and fats. Promotes a healthy skin and coat with omega-3 and 6 fatty acids, and vision and heart health with essential taurine. 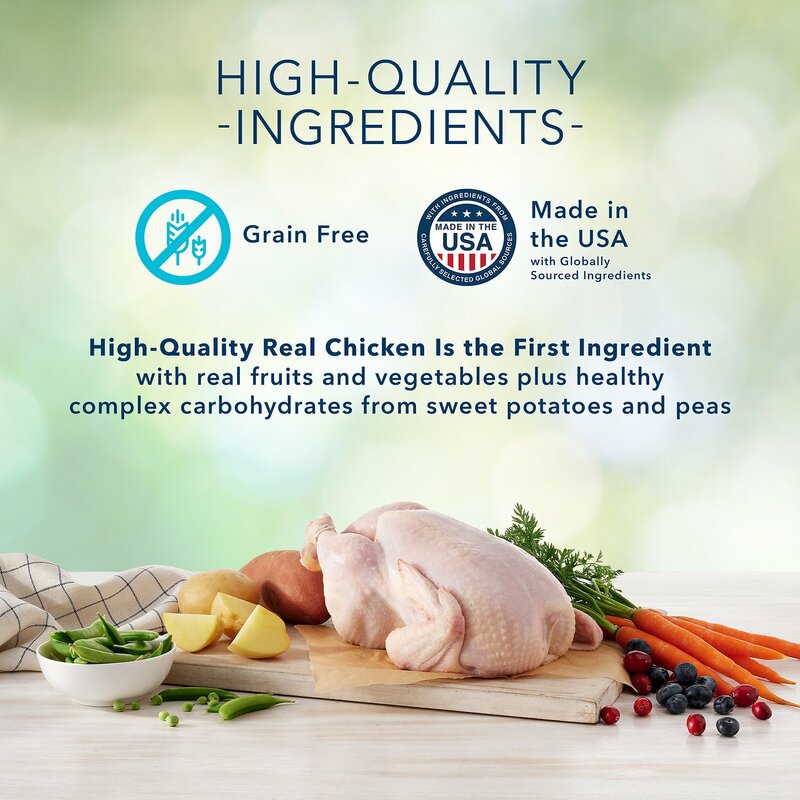 Made in the USA with zero grains, chicken or poultry by-product meals, corn, wheat, gluten or soy so it’s great for kitties with food sensitivities or allergies. Deboned Chicken, Chicken Meal, Tapioca Starch, Peas, Pea Protein, Potatoes, Chicken Fat (preserved with Mixed Tocopherols), Menhaden Fish Meal (source of Omega 3 Fatty Acids), Pea Fiber, Powdered Cellulose, Flaxseed (source of Omega 6 Fatty Acids), Natural Flavor, Choline Chloride, Calcium Sulfate, DL-Methionine, Potassium Chloride, Dehydrated Alfalfa Meal, Calcium Chloride, Dried Chicory Root, Salt, Alfalfa Nutrient Concentrate, Taurine, Calcium Carbonate, preserved with Mixed Tocopherols, Sweet Potatoes, Carrots, Vegetable Juice for color, Ferrous Sulfate, Niacin (Vitamin B3), Iron Amino Acid Chelate, Zinc Amino Acid Chelate, Zinc Sulfate, Vitamin E Supplement, Blueberries, Cranberries, Barley Grass, Parsley, Turmeric, Dried Kelp, Yucca Schidigera Extract, Copper Sulfate, Thiamine Mononitrate (Vitamin B1), Copper Amino Acid Chelate, L-Ascorbyl-2-Polyphosphate (source of Vitamin C), L-Lysine, L-Carnitine, Biotin (Vitamin B7), Vitamin A Supplement, Manganese Sulfate, Manganese Amino Acid Chelate, Pyridoxine Hydrochloride (Vitamin B6), Calcium Pantothenate (Vitamin B5), Riboflavin (Vitamin B2), Vitamin D3 Supplement, Vitamin B12 Supplement, Folic Acid (Vitamin B9), Dried Yeast, Dried Enterococcus faecium fermentation product, Dried Lactobacillus acidophilus fermentation product, Dried Aspergillus niger fermentation extract, Dried Trichoderma longibrachiatum fermentation extract, Dried Bacillus subtilis fermentation extract, Calcium Iodate, Sodium Selenite, Oil of Rosemary. Like humans, some furry companions don't do well with grain-based diets. 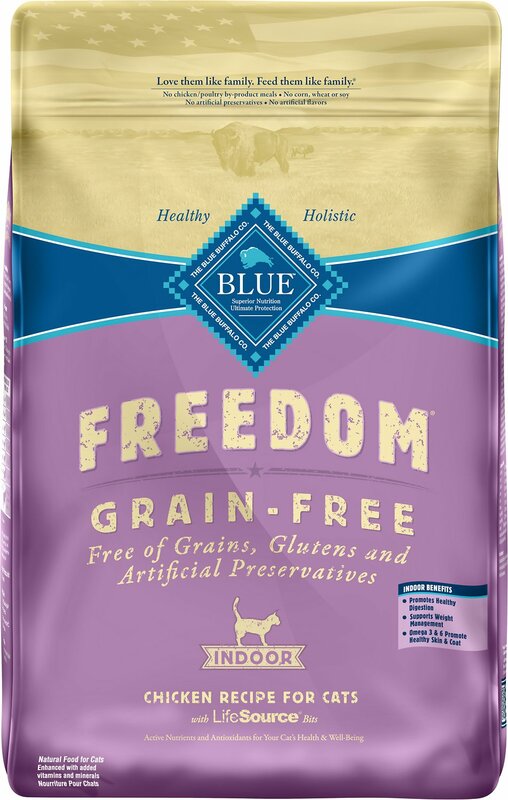 BLUE Freedom was created for pet parents who prefer to feed their cats a high-quality, grain-free food that always features real meat—without any of the grains that contain gluten. Like all BLUE foods, it's made from the finest natural ingredients enhanced with vitamins and minerals. BLUE has more life stage and lifestyle-specific foods than any other natural cat food. 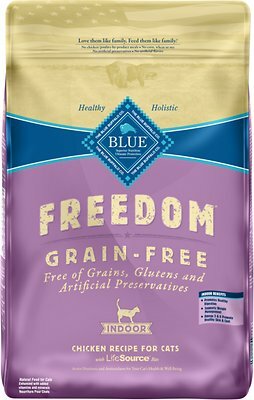 You'll find healthy, delicious BLUE Freedom recipes for your kitten, adult or mature cat—all free from grains. CRANBERRIES: Rich in antioxidants, dietary fiber, manganese and vitamin K, and supports immunity and urinary health. BLUEBERRIES: Loaded with vitamins C and E, healthy carbs, fiber and powerful antioxidants for immune system support and urinary tract health. CARROTS: Excellent source of fiber and minerals, and a good natural source of beta-carotene, an antioxidant essential for neutralizing free radicals. SWEET POTATOES: Excellent source of complex carbs, vitamins, minerals, beta-carotene, and starch that converts easily into sugar for quick energy. 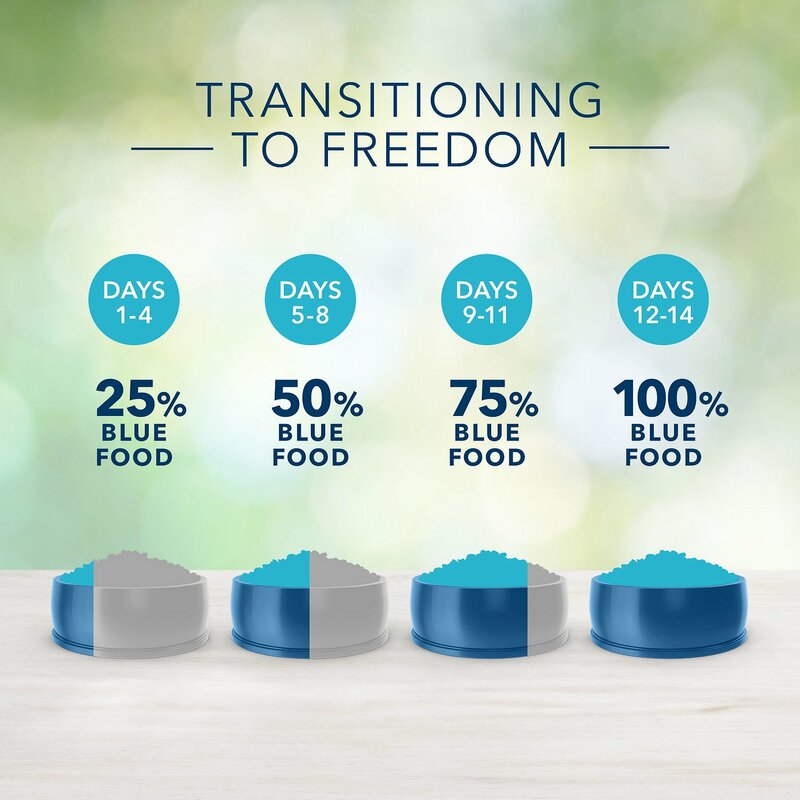 All BLUE dry food formulas feature a precise blend of vitamins, minerals and antioxidants selected by holistic veterinarians and animal nutritionists to help promote immune system health, fulfill life stage requirements and support a healthy oxidative balance. Healthy Muscle Development: High-quality protein from real chicken or fish helps build and maintain strong muscles. Healthy Digestion: High-quality protein and natural sources of fiber help promote nutrient absorption and digestive health. Healthy Skin and Coat: Omega-3 and 6 fatty acids help promote a shiny coat and healthy skin. Healthy Immune System: Essential vitamins, chelated minerals and important antioxidants help support the immune system. Healthy Weight: Carefully balanced calories from proteins and fat help maintain an ideal, healthy body weight. A special weight-control formula features high-quality deboned chicken plus L-carnitine to help develop lean muscles, which also supports weight management. Healthy Heart and Eyes: Cats cannot manufacture adequate amounts of taurine, an amino acid essential for healthy eyes and heart function. They must obtain this necessary nutrient from their food. I have three senior cats who love this dry food. I leave it out for them in the morning when I leave for work and even though they get a small can of wet food in the am they still munch on this through the day and none of them are over weight. 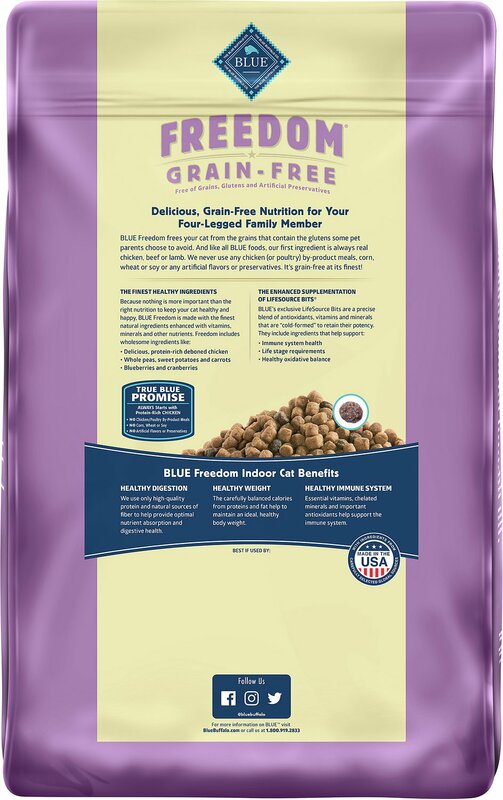 Blue Buffalo Grain Free cat food was suggested by the Humane Society when we adopted our cat. She is extremely allergic to grains. She enjoys the taste, less waste in her litter box, and the other cats like it too! We have stopped purchasing all other cat food and use this for all. Finally Cat food they can digest ! I have 3 indoor cats and one outdoor ( Feral ) all 4 are eating this, and best of all I am not cleaning up puke! 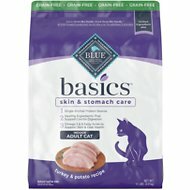 After several tries of other recipes of blue buffalo offered to my cat she is loving the blue indoor. Only the best will do. Their hair shins and they hardly shed. I give it all to the food. This is a very convenient service especially during the winter months. I love not having to worry about running out of cat food. Chewy.com takes care of this chore for me!!! Great price and wonderful customer service! My cats love this, they’ve been on blue all their lives and are thriving. We do mix it with indoor weight management to help with their weight.